Can AIOps Really Reduce IT Noise? If you’re part of a NOC or an IT Ops team, or if you manage one, you know that overwhelming IT noise is your #1 enemy. It floods your teams with false-positives, it buries critical root-cause events and it makes it hard to proactively detect expensive P1 and P0 outages. But can AIOps tools be the answer? •Help you catch P2s and P3s before they become customer-impacting P1 and P0 outages. Redesigning a monitoring platform in a large enterprise is no easy feat: it's ripe with pitfalls, gotchas, and comes with plenty of frustrating aspects that smaller companies don't often experience. Seemingly simple questions around "Who gets paged for this?" can turn into a week's worth of meetings, and never mind coming to consensus around what tools you should be using. Mike Julian is the CEO of The Duckbill Group, a consultancy helping companies lower their AWS bills. When he's not wondering what he's gotten himself into, Mike is the host of the Real World DevOps Podcast and editor/analyst at Monitoring Weekly. He wrote Practical Monitoring (O'Reilly), a book about actionable ways to improve your monitoring. He was previously an SRE/DevOps Engineer/system administrator for companies such as Taos Consulting, Peak Hosting, Oak Ridge National Laboratory, and many more. Mike is originally from Knoxville, TN (Go Vols!) and currently resides in Portland, OR. - Incidents by source, severity and other parameters. To do this, your IT Ops team is probably wasting precious hours every week, wrangling with spreadsheets and general-purpose reporting tools that are hard to use and update. Sound familiar? Utilizing a unified analytics approach can change all of that and give back hours that your IT Ops team doesn’t have! Join this webinar to learn how BigPanda Unified Analytics, purpose-built for IT Ops reporting and analysis, can help you quickly and easily analyze, visualize and improve your key IT Ops KPIs and metrics. 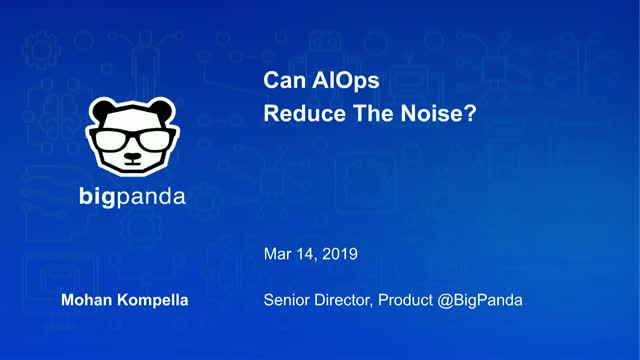 Title: Can AIOps Really Reduce IT Noise?